I’d like to introduce you to Mr & Mrs Homer. Homer as in the Simpsons. I’m not sure why, I didn’t christen him! 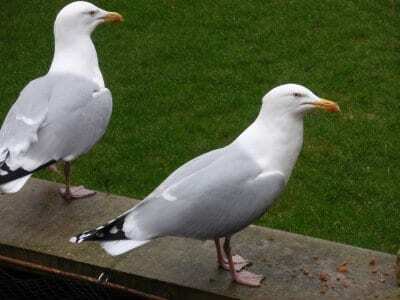 Seagulls pair for life, and they can live for many years. All baring a fatality they can live until they are 20+, so this pair have got some time left yet, and with everyone round and about knowing them by name and watching out for their welfare, they are well looked after by the whole neighbourhood. It’s Homer who’ll you’ll see as the mascot for Visit Cleveleys and in fact all our Visit Fylde Coast websites. He’s distinctive, and it’s what people recognise on our email newsletter and branding. It was a neighbour of ours who first started feeding a seagull and got him hand tame – and Homer made hay while the sun shone, sitting on their garden wall and just staring into the house until food was forthcoming. At first I wasn’t sure whether the bird we call Homer was the same one, but now we each have a pair of tame gulls – I’ve seen them sat begging at our neighbours house and at ours at the same time, so they have to be different birds. It’s the life of Riley for them as all they have to do to get their next meal is to look cute! 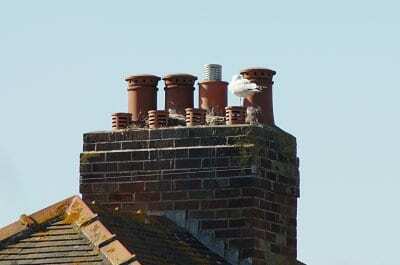 Each year, Mr and Mrs Homer set up nest on a nearby chimney pot, building a scraggy heap of straw that eventually becomes home to usually three ugly ducklings. We watch them walking about on the chimney pot and having a peck at each other, then they get increasingly adventurous and start jumping up and down and onto the roof below, and make all of us observers and protectors feel anxious. If they fall onto the tiles they usually get ignored and eventually die. 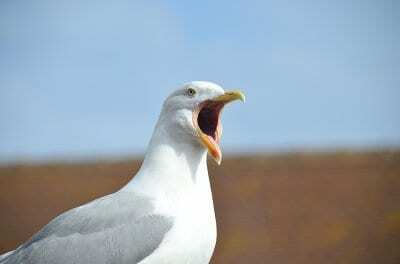 As they get well fed with plenty of food, Homer’s family of three usually makes it to adulthood, whereas other gulls might only manage to raise one or two birds to maturity. Their problems aren’t a lack of food but falling off the roof, being hit by cars and other accidents. As the chicks get bigger, Homer gets increasingly cheeky with his requests for food. In winter when he’s only looking after himself, he comes for breakfast but is less demanding. When the chicks are being fed he gets increasingly ravenous and begs harder and harder as they get bigger. When the family gets big enough, he brings them to be fed too, and we have mum and dad and the kids all on the lawn fighting over food. The first week is a bit tense as they learn how to fly over the garden fence and bushes, in fact before today they have brought them to our garden on the day that they fledge and just leave them with us for the day as chief babysitters. They know that they are safe and we will look after them – not that it does much for our nerves! The parents are good at maintaining order with a sharp peck, and a seagull can actually give you quite a sharp peck with that beak. At the back end of winter when the kids are big enough Homer will start to shoo them off and make sure that they go, so that they can then start the whole process again the year after, with another nest and more babies. As they say, That’s Life! All year round, as soon as Homer sees movement in the house he’s there. He has vantage points on the roof, walls and fences, where he can see into different rooms in the house as we go about our business. When he gets impatient and thinks we should be attending to his needs, he bangs on the window. He watches us go up the stairs to the office, and then ten minutes later, we hear ‘bang, bang, bang’ and all crack out laughing as he bangs his beak on the window at the foot of our stairway! When he’s in full demand at the height of feeding babies, he also comes and bangs on the back door, which is really funny. He sits on the fence in the back garden, watching us while we garden or hang out the washing in summer. If we have an afternoon in the garden he’ll lie down to sunbathe, then joins us on the lawn, padding about right at the side of the dogs who are just not interested in him at all. He’s a very good waste disposal machine too, and eats all our kitchen scraps up. When we’ve had lunch we take him the left over meat, fish, potatoes (he doesn’t like vegetables). We only have to go in the garden and shout him or wave and he comes immediately to be fed. It always thrills me that you can shout a wild bird and he will come to you. Amazing. I’m also sure that he recognises us too. He spends most of his time hanging about around our house (can you blame him!) and I would guess that he doesn’t fly very far away, and as soon as he sees us come back home if we’ve been out, he’s on sentry duty. One day in the summer we went for a walk towards Rossall School. After a little while we realised that we were being followed by a seagull, and in fact it was Homer. He followed us all the way to the end of our walk and all the way back home. He’s done it since then too. How clever is that. I find it a great pleasure that a completely wild bird trusts me enough to come and take food out of my hand, and watch me pottering about in the garden. I know that some people would say that you shouldn’t make a wild animal reliant on you for food, but I am quite prepared to continue feeding Homer until he draws his last breath, even if it takes another 20 years. I simply wouldn’t have started feeding him in this way unless I was prepared to carry on. It’s not fair to get an animal dependant on you and then withdraw your help with potentially fatal consequences. (Think about it if you have a wild animal to feed). I know that seagulls are like Marmite – some people hate them intensely – but for me, being part of this seagulls life is a thrill of living at the seaside, and I know that lots of other people have their own tame seagulls too, so Homer isn’t the only one. Homer, in his favourite pose! I too have a pet seagull however mine has only one usable leg and every time he tries to fly I’m nervous like a mother would be leaving her baby to fly in the sky without her? He has recently well in the last two days flown over the houses and landed on the other side where he just sits screaming for me I have had to get in my car and go Clifton Drive to see if I can find him I also have dogs cats and Horses and they are not half as much trouble as Stevie seagull I don’t know how I’m going to protect him in the next week when he flies further and further away I don’t know whether he’s going to come back or whether he’s going to be injured and I cannot find any kind of information about this on the internet ? I know what you mean Joella! I worry about Homer too, I think he’s getting to be an old bird now (he’s been with us over 10 years) and I worry about him being attacked, run over or just dying of old age. However, at the end of the day you can only do your best. They aren’t pets, they are wild animals, so protect and look after them as best as you can but accept that they live a wild life.